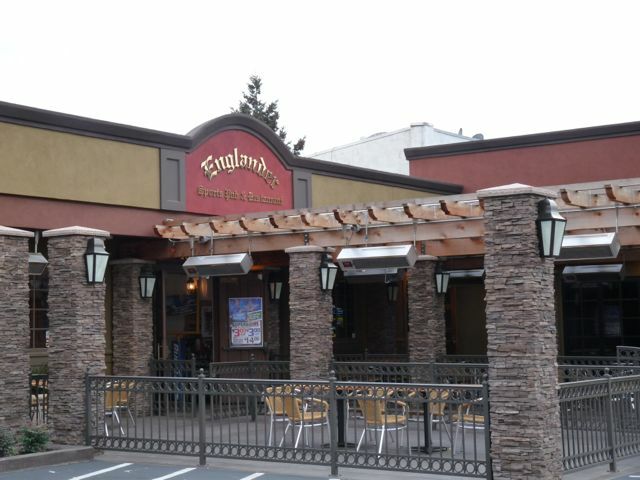 The Englander is a large, sprawling sports bar and restaurant centered on English-themed pub fare – fish and chips, shepherd’s pie and more, along with burgers. They specialize in English ales, sometimes featuring pints which are not easily found in the States. They have over 100 taps, which also include a wide variety of beers ranging from the typical yellow-fizzy-mass-produced beers to English and German classics and some fine west coast microbrews. The San Leandro location makes this a good venue to enjoy a brew before, during or after nearby Warriors, A’s or Raiders games, a short BART-hop away. If you don’t have a ticket, there are plenty of TVs here at the bar. Extras: Side meeting and banquet rooms are a favorite place for kids’ soccer, baseball, etc. team parties, and other private events. The Englander also offers free copies of England’s only national newspaper, The Union Jack. Walk out of the BART station, cross the street at the crosswalk you see to your right. Continue south along San Leandro Blvd. another block, then turn left on Parrott. Walk four blocks and look for a small parking lot on your right, where you’ll find The Englander. Walking directions from BART are above on this page. http://beerjudging101class.eventbrite.com/ Beer Judging Seminars led by Grand Master beer judge David Teckam.